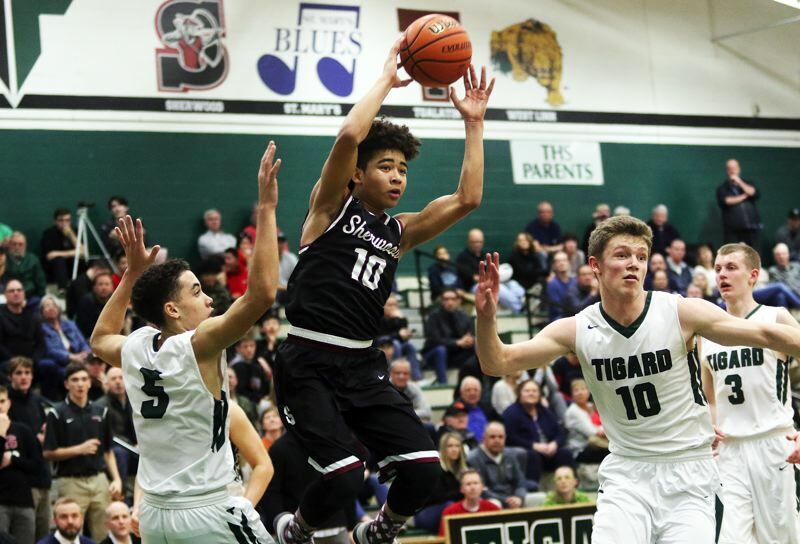 The Sherwood, Tigard and Tualatin high school boys basketball teams have something in common as they enter postseason play on Wednesday. All three teams insist that they were ready for action. "I think we're ready for the playoffs," Tigard senior post Austin Dufort said following the Tigers' regular-season finale loss to Three Rivers League champion Lake Oswego on Friday. "We'll have a good showing. I like our chances." "We'll be prepared for the playoffs," Sherwood senior wing Billy Hale said following the Bowmen's double-overtime loss to Tualatin last Thursday. "We feel like we can play with anyone"
"We're ready for the playoffs," Tualatin junior post Bridger Steppe said following the game at Sherwood. "Games like this will help us." Tualatin (16-8, No. 12 team in the OSAA power rankings), the No. 4 team out of the Three Rivers, is set to host Sheldon (13-11, No. 21) in a Class 6A state playoff first-round game Wednesday, starting at 7 p.m. at Tualatin High School. Tigard (13-10, No. 18) is slated to travel to McMinnville (17-7, No. 15) on Wednesday for a 7 p.m. game and Sherwood (13-11, No. 28) is scheduled to play at McNary (19-5, No. 5) at 7 p.m. on Wednesday. Tualatin, if it wins Wednesday, will either host Sherwood, or play at McNary, in a Class 6A state playoff second-round game on Saturday. Tigard, if it wins at McMinnville on Wednesday, will either host Sunset or play on the road against Grant (likely at the Marshall campus) in a second-round game on Saturday. Sherwood, if it wins at McNary on Wednesday, will travel to Tualatin or Sheldon for a second-round game on Saturday. The winners of Saturday's second-round state playoff games will advance to play at the Class 6A state tournament, which starts March 8 at the University of Portland's Chiles Center.